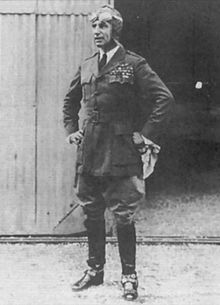 William Lendrum "Billy" Mitchell (December 28, 1879 - February 19, 1936) was a United States Army general who is regarded as the father of the U.S. Air Force. He is one of the most famous and most controversial figures in the history of American airpower. 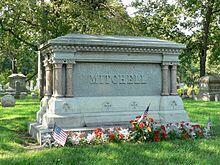 Born in Nice, France, to John L. Mitchell, a wealthy Wisconsin senator and his wife Harriet, Mitchell grew up on an estate in what is now the Milwaukee suburb of West Allis, Wisconsin. His grandfather Alexander Mitchell, a Scotsman, was the wealthiest person in Wisconsin for his generation and established what became the Milwaukee Road along with the Marine Bank of Wisconsin. Mitchell Park and the important shopping precinct Mitchell Street were named in honor of Alexander. Billy Mitchell graduated from Columbian College of George Washington University, where he was a member of the DC Alpha chapter of the Phi Kappa Psi Fraternity. He then enlisted as a private at age 18 during the Spanish American War. Quickly gaining a commission due to his father's influence, he joined the U.S. Army Signal Corps. Following the cessation of hostilities, Mitchell remained in the army. He predicted as early as 1906, while an instructor at the Army's Signal School in Fort Leavenworth, Kansas, that future conflicts would take place in the air, not on the ground. After tours in the Philippines and Alaska Territory, Mitchell was assigned to the General Staff-at the time, its youngest member at age 32. He became interested in aviation and was assigned to the Aeronautical Division, U.S. Signal Corps, a predecessor of the Army Air Service. In 1916 at age 38 he took private flying lessons because the Army considered him too old and too high-ranking for flight training. On April 6, 1917, the United States declared war on Germany, and Mitchell, by then a lieutenant colonel, was in Spain en route to France as an observer. He immediately went to Paris and set up an office for the Aviation Section, from which he collaborated extensively with British and French air leaders such as General Hugh Trenchard, studying their strategies as well as their aircraft. He made the first flight by an American officer over German lines on April 24, flying with a French pilot. Before long, Mitchell had gained enough experience to begin preparations for American air operations. Mitchell rapidly earned a reputation as a daring, flamboyant, and tireless leader. He eventually was elevated to the rank of Brigadier General and commanded all American air combat units in France. In September 1918 he planned and led nearly 1,500 British, French and Italian aircraft in the air phase of the Battle of Saint-Mihiel, one of the first coordinated air-ground offensives in history. 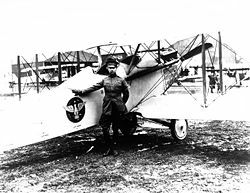 He ended the war as Chief of Air Service, Group of Armies, and became Chief of Air Service, Third Army after the armistice. Returning to the United States in January 1919, it had been widely expected throughout the Air Service that Mitchell would receive the post-war assignment of Director of Air Service. Instead he returned to find that Maj. Gen. Charles T. Menoher, an artilleryman who had commanded the Rainbow Division in France, had been appointed director on the recommendation of his classmate General Pershing, to maintain operational control of aviation by the ground forces. Mitchell received appointment on February 28, 1919, as Director of Military Aeronautics, to head the flying component of the Air Service, but that office was in name only as it was a wartime agency that would expire six months after the signing of a peace treaty. Menoher instituted a reorganization of the Air Service based on the divisional system of the AEF, eliminating the DMA as an organization, and Mitchell was assigned as Third Assistant Executive, in charge of the Training and Operations Group, Office of Director of Air Service (ODAS), in April 1919. He maintained his temporary wartime rank of brigadier general. When the army was reorganized by Congress on June 4, 1920, the Air Service was recognized as a combatant arm of the line, third in size behind the Infantry and Artillery. On July 1, 1920, Mitchell was promoted to the permanent rank of colonel, Signal Corps, but also received a recess appointment (as did Menoher) to become Assistant Chief of Air Service with the rank of brigadier general. On July 30, 1920, he was transferred and promoted to the permanent rank of colonel, Air Service, with date of rank from July 1, placing him first in seniority among all Air Service branch officers. On March 4, 1921, Mitchell was appointed Assistant Chief of Air Service by new President Warren G. Harding with consent of the Senate. He returned from Europe with a fervent belief that within a near future, possibly within ten years, air power would become the predominant force of war, and that it should be united entirely in an independent air force equal to the Army and Navy. He found encouragement in a number of bills before Congress proposing a Department of Aeronautics that included an air force separate from either the Army and Navy, primarily legislation introduced in August 1919 by Senator Harry New (Rep-Indiana), influenced by the recommendations of a fact-finding commission sent to Europe under the direction of Assistant Secretary of War Benedict Crowell in early 1919 that contradicted the findings of Army boards and advocated an independent air force. Mitchell believed that the use of floating bases was necessary to defend the nation against naval threats, but Chief of Naval Operations Adm. William S. Benson had dissolved Naval Aeronautics as an organization early in 1919. However, senior naval aviators feared that land-based aviators in a "unified" independent air force would no more understand the requirements of sea-based aviation than ground forces commanders understood the capabilities and potential of air power, and vigorously resisted any alliance with Mitchell. The Navy's civilian leadership was equally opposed, if for other reasons. On April 3 Mitchell met with Assistant Secretary of the Navy Franklin D. Roosevelt and a board of admirals to discuss aviation, and Mitchell urged the development of naval aviation because of growing obsolescence of the surface fleet. His assurances that the Air Service could develop whatever bomb was needed to sink a battleship, and that a national defense organization of land, sea, and air components was essential and inevitable, were met with cool hostility. Mitchell found his ideas publicly denounced as "pernicious" by Roosevelt. 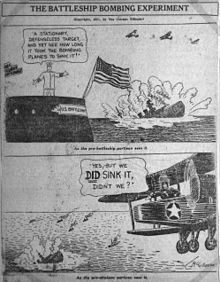 Convinced that within as soon as ten years strategic bombardment would become a threat to the United States and make the Air Service the nation's first line of defense instead of the Navy, he began to set out to prove that aircraft were capable of sinking ships to reinforce his position. His relations with superiors continued to sour as he began to attack both the War and Navy Departments for being insufficiently farsighted regarding airpower. He advocated the development of a number of aircraft innovations, including bombsights, sled-runner landing gear for winter operations, engine superchargers and aerial torpedoes. 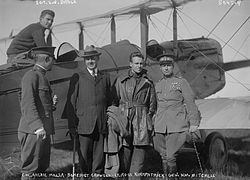 He ordered the use of aircraft in fighting forest fires and border patrols, and encouraged the staging of a transcontinental air race, a flight around the perimeter of the United States. He also encouraged Army pilots to challenge speed, endurance and altitude records. In short, he encouraged anything that would further develop the use of the aircraft, and that would keep aviation in the news. The Navy and the Air Service were at cross purposes regarding the tests. Supported by General Pershing, the Navy set rules and conditions that enhanced the survivability of the targets, stating that the purpose of the tests was to determine how much damage ships could withstand. The ships had to be sunk in at least 100 fathoms of water (so as not to become navigational hazards), and the Navy chose an area 50 miles (80 km) off the mouth of Chesapeake Bay rather than either of two possible closer areas, minimizing the effective time the Army's bombers would have in the target area. The planes were forbidden from using aerial torpedoes, would be permitted only two hits on the battleship using their heaviest bombs, and would have to stop between hits so that a damage assessment party could go aboard. Smaller ships could not be struck by bombs larger than 600 pounds, and also were subject to the same interruptions in attacks. On July 20, 1921, the Navy brought out the ex-German World War I battleship, Ostfriesland, considered unsinkable. One day of scheduled 230, 550 and 600 lb (270 kg) bomb attacks by Marine, Navy and Army aircraft settled the Ostfriesland three feet by the stern with a five degree list to port; she was taking on water. Further bombing was delayed a day, the Navy claiming due to rough seas that prevented their Board of Observers from going aboard, the Air Service countering that as the Army bombers approached, they were ordered not to attack. Mitchell's bombers were forced to circle for 47 minutes, as a result of which they dropped only half their bombs, and none of their large bombs. Picture - USS Alabama hit by a white phosphorus bomb dropped by an NBS-1 in bombing tests, September 1921. At this point, 2,000 lb (910 kg) bombs were loaded and a flight was dispatched consisting of two Handley-Page O/400 and six NBS-1 bombers. One Handley Page dropped out for mechanical reasons, but the NBS-1s dropped six bombs in quick succession between 12:18 p.m. and 12:31 p.m., aiming for the water near the ship. 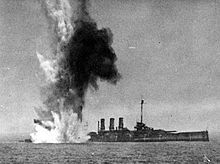 There were no direct hits but three of the bombs landed close enough to rip hull plates as well as cause the ship to roll over. The ship sank at 12:40 p.m., 22 minutes after the first bomb, with a seventh bomb dropped by the Handley Page on the foam rising up from the sinking ship. Nearby the site, observing, were various foreign and domestic officials aboard the USS Henderson. "...sea craft of all kinds, up to and including the most modern battleships, can be destroyed easily by bombs dropped from aircraft, and further, that the most effective means of destruction are bombs. [They] demonstrated beyond a doubt that, given sufficient bombing planes-in short an adequate air force- aircraft constitute a positive defense of our country against hostile invasion." The fact of the sinkings was indisputable, and Mitchell repeated the performance twice in tests conducted with like results on obsolete U.S. pre-dreadnought battleship Alabama in September 1921, and the battleships Virginia and New Jersey in September 1923. The latter two ships were subjected to teargas attacks and hit with specially designed 4,300 lb (2,000 kg) demolition bombs. 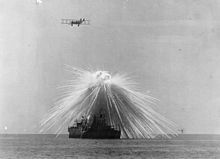 The bombing tests had several immediate and turbulent results. Almost immediately the Navy and President Harding were incensed by an apparent demonstration of naval weakness just as Harding was announcing on August 11 invitations to other naval powers to gather in Washington for a conference on the limitation of naval armaments. Statements asserting the obsolescence of the battleship by disarmament proponents in Congress such as Sen. William Borah heightened official anxiety. Both services tried to defuse the results by reports from the Joint Board and Gen. Pershing dismissing Mitchell's claims, and suppressing Mitchell's report, but the latter was leaked to the press. Gen. Menoher in September forced a showdown over Mitchell as the bombing tests continued. He confronted Secretary Weeks and demanded that either he relieve Mitchell as Assistant Chief of Air Corps or accept Menoher's resignation. Weeks allowed Menoher to resign on October 4 and return to the ground forces "for personal reasons". A reciprocal resignation offer from Mitchell was refused. Maj. Gen. Mason Patrick was again chosen by Pershing to sort out a mess in the Air Service and became the new Chief on October 5. Patrick made it clear to Mitchell that although he would accept Mitchell's expertise as counsel, all decisions would be made by Patrick. When Mitchell soon got into a minor but embarrassing protocol rift with R/Adm. William A. Moffett at the start of the naval arms limitation conference, Patrick assigned him to an inspection tour of Europe with Alfred Verville and Lt. Clayton Bissell that lasted the duration of the conference over the winter of 1921-22. Mitchell was dispatched by president Harding to West Virginia. His mission was to stop the warfare that had broken out between the United Mine Workers, Stone Mountain Coal Company, the Baldwin-Felts Agency, and other groups after the Matewan Massacre. In March 1925, when his term as Assistant Chief of the Air Service expired, he reverted to his permanent rank of Colonel and was transferred to San Antonio, Texas, as air officer to a ground forces corps. Although such demotions were not unusual in demobilizations-Patrick himself had gone from Major General to Colonel upon returning to the Army Corps of Engineers in 1919-the move was widely seen as punishment and exile, since Mitchell had petitioned to remain as Assistant Chief when his term expired, and his transfer to an assignment with no political influence at a relatively unimportant Army base had been directed by Secretary of War John Weeks. Picture - The front section of the Shenandoah wreck. Picture - A scene taken from Mitchell's court-martial, 1925. This scene was recreated for the 1955 movie The Court-Martial of Billy Mitchell. Note the "turned-down" collar uniform worn by Mitchell, for which the Air Service had campaigned for several years. In response to the Navy dirigible Shenandoah crashing in a storm, killing 14 of the crew, and the loss of three seaplanes on a flight from the West Coast to Hawaii, Mitchell issued a statement accusing senior leaders in the Army and Navy of incompetence and "almost treasonable administration of the national defense." In October 1925 a charge with eight specifications was preferred against Mitchell on the direct order of President Calvin Coolidge accusing him of violation of the 96th Article of War, an omnibus article that Mitchell's chief counsel, Congressman Frank Reid, declared to be "unconstitutional" as a violation of free speech. The court martial began in early November and lasted for seven weeks. The youngest of the 12 judges was Major General Douglas MacArthur, who later described the order to sit on Mitchell's court-martial as "one of the most distasteful orders I ever received." Of the thirteen judges, none had aviation experience and three were removed by defense challenges for bias, including Major General Charles P. Summerall, the president of the court. The case was then presided over by Major General Robert Lee Howze. 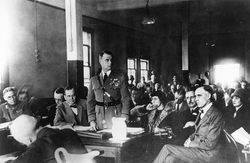 Among those who testified for Mitchell were Edward Rickenbacker, Hap Arnold, Carl Spaatz and Fiorello La Guardia. The trial attracted significant interest, and public opinion supported Mitchell. However, the court found the truth or falseness of Mitchell's accusations to be immaterial to the charge and on December 17, 1925, found him "guilty of all specifications and of the charge". The court suspended him from active duty for five years without pay, which President Coolidge later amended to half-pay. The generals ruling in the case wrote, "The Court is thus lenient because of the military record of the Accused during the World War." MacArthur later claimed he had voted to acquit, and Fiorello La Guardia claimed that MacArthur's "not guilty" ballot had been found in the judges' anteroom. MacArthur felt "that a senior officer should not be silenced for being at variance with his superiors in rank and with accepted doctrine." Mitchell viewed the election of his one-time antagonist Franklin D. Roosevelt as advantageous for air power, and met with him early in 1932 to brief him on his concepts for a unification of the military in a department of defense that intrigued and interested Roosevelt. Mitchell believed he might receive an appointment as assistant secretary of war for air or perhaps even secretary of defense in a Roosevelt administration, but neither prospect materialized. In 1926, Mitchell made his home with his wife Elizabeth at the 120-acre (0.49 km) Boxwood Farm in Middleburg, Virginia which remained his primary residence until his death. He died of a variety of ailments including a bad heart and an extreme case of influenza in a hospital in New York City on February 19, 1936, and was buried at Forest Home Cemetery in Milwaukee, Wisconsin. Mitchell's son, John, served in the Army as a First Lieutenant, dying in 1942. Mitchell's first cousin, the Canadian George Croil, went on to secure an autonomous status for the Royal Canadian Air Force and serve as its first Chief of the Air Staff during the opening year of World War II. Mitchell's concept of a battleship's vulnerability to air attack under "war-time conditions" would be vindicated after his death; a number of warships were sunk by air attack alone during World War II. The battleships Conte di Cavour, Arizona, Utah, Oklahoma, Prince of Wales, Roma, Musashi, Tirpitz, Yamato, Schleswig-Holstein, Impero, Limnos, Kilkis, Marat, Ise and Hyūga were all put out of commission or destroyed by aerial attack including bombs, air-dropped torpedoes and missiles fired from aircraft. Some of these ships were destroyed by surprise attacks in harbor, others were sunk at sea after vigorous defense. However, most of the sinkings were carried out by aircraft carrier-based planes, not by land-based bombers as envisioned by Mitchell. The world's navies had responded quickly to the Ostfriesland lesson. In the 1943 classic World War II movie A Guy Named Joe the unnamed "General" who gives the deceased pilot his new assignment was "probably modeled after Billy Mitchell." In 1955, the Air Force Association passed a resolution calling for the voiding of Mitchell's court-martial. His son William Jr. petitioned in 1957 to have the court-martial verdict set aside, which the Air Force denied while expressing regret about the circumstances under which Mitchell's military career ended. The Association named their Institute for Airpower Studies for the General and the current director is Dr. Rebecca Grant. Inducted into the National Aviation Hall of Fame in 1966. William (Billy) Mitchell High School in Colorado Springs, Colorado is also named after him. Turn 13 at the Road America race circuit near Elkhart Lake, Wisconsin, is also known as Bill Mitchell Bend. A now-demolished bridge that formerly crossed the track was known as the Billy Mitchell Bridge. 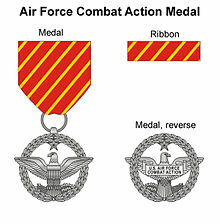 Picture - Obverse and reverse of the Air Force Combat Action Medal. At The George Washington University in Washington, D.C., General Mitchell was honored by his alma mater with the naming of a large residence building, William Mitchell Hall. The Civil Air Patrol cadet program includes an award called the General Billy Mitchell Award., signifying the rank of Cadet 2nd Lieutenant, and completion of several tests and essays. Henrotin, Joseph. L'Airpower au 21e six�cle: Enjeux et perspectives de la strat�gie a�rienne. Bruxelles: Emile Bruylant (RMES), 2005. ISBN 2-8027-2091-0. Kennett, Lee. The First Air War, 1914-1918. New York: Free Press, 1991. ISBN 0-684-87120-3.